German markets ended Tuesday's session solidly in negative territory, extending the losses from the previous day. Global equity markets are under pressure due to continued worries over growth with traders remaining cautious ahead of a meeting between US President Donald Trump and Chinese President Xi Jinping at the G20 summit in Argentina later this month. Meanwhile, the European Commission is likely to formally reject Italy's 2019 budget today thus putting additional pressure on European indices. 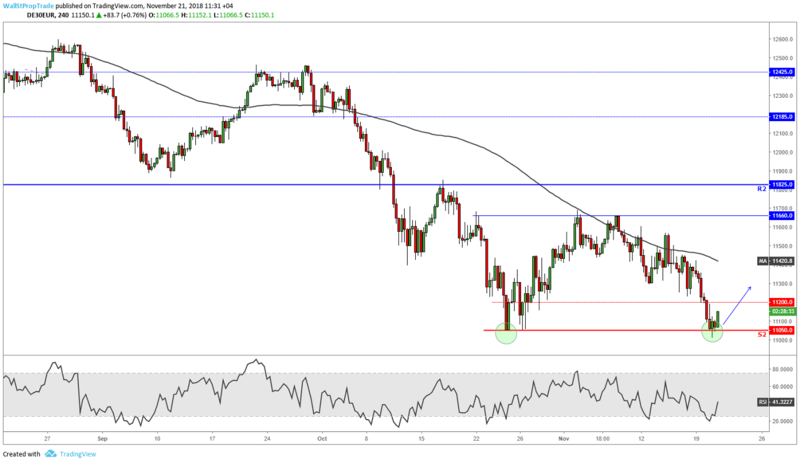 From a technical perspective, the German index kept moving lower throughout the whole session breaking through the 11200 support but rebounding off the 11050 yearly low and key technical support level. A bullish engulfing candle is forming on the 4H chart. This bullish pattern might push prices back above the 11200 level to test the 200-period moving average in the 11300 to 11350 zone. The RSI looks bullish suggesting the current rebound will extend further for at least the short-term.